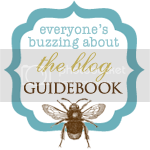 Have you ever heard about the Blog Guidebook? If not, you really should check it out. Especially if you are new to blogging. It’s a great, FREE, way to get your blog out there. My favorite part is that they have blogs broken down by category! Have you ever tried looking for something by surfing through blogland? Nightmare! Google can help sometimes, but you have to sort through all the results that aren’t even blogs. It’s a great resource. So, go on! Check it out!